Use a "standard" history format, as for adult patients. social history - VITAL - note who the "carers" are and the home background (e.g. bedsit), for "social support"
drug history - especially "over the counter" medicine. Examine babies/infants on the lap of parent if possible. Get on your knees for small children. Don't ask a toddlers permission to examine him/her (they all refuse). Explain what you intend to do, then do it. Examine the part that presents to you in general; progressing gradually "top to bottom"; save unpleasant things till last (e.g. auroscope). An accurate weight, height and head circumference are occasionally needed, especially where there is a chronic problem, and is never wasted! All children should have basic observations recorded! EMLA cream should be applied to venepuncture site 45 minutes before procedure whenever possible. Calpol is essential against pain and fever. Intranasal diamorphine can safely be used [BestBets] for more severe pain (unfortunately not available in paranoid Eire). Please ask advice from a senior ED doctor before sedating any child in the Department. Antecubital veins can be used in older children (usually over 2 years). Below that age use veins on the dorsum of the hands or feet; use either a butterfly or, in more difficult cases, the hub of a 20g needle may be broken off and the needle passed through the skin along the line of a vein - once punctured, the blood will drip back through the end of the needle. In babies a heel prick sample will often yield enough blood. Usually relatively easy in neonates (24G or 26G) or older children (over 2 - 3 years 22G or bigger). The same sites as indicated for blood collection can be used, as can scalp veins in infants. But do not waste time! Consider alternatives (interosseous route, IM medication). However, if taking blood is required take enough and some spare! Consider the investigations which may be needed and/or store the blood (clotted tube). Venesection is traumatic for the children and to go back for more blood is cruel! (e.g. when taking blood for FBC, always take blood for blood culture in case it is required). Do not be afraid to investigate in the ED where appropriate - time obtaining samples and waiting for results can be invaluable for observing children in the department and waiting for Calpol to work! On the whole parents usually know when their children are very ill. Treatment is more important than investigations. Be more cautious the younger the child, especially under 3 months. Be ready to refer children who present to the department with the same symptoms on more than one or two occasions; there is always a reason. Do not be pressured by time/work into an "instant decision" - use a period of observation. ASK ADVICE! from your middle grade or consultant before calling the children's hospital. All paediatric patients who arrive in the ED with GP letters of referral should be reviewed directly by the Paediatric team. All paediatric patients accepted by the Paediatric Registrar to ED should be reviewed directly by the Paediatric NCHD. At times of particular congestion in the ED, you may be asked to review patients directly by the Shift Leader. Please oblige by responding to such requests courteously and efficiently. Ensure that children stay no longer than is absolutely necessary in the ED. Once you have made a clinical decision to admit the patient, arrange for immediate transfer to St. Anne’s ward if a bed is available. There is no need for a patient to stay in ED ‘waiting for results’ once it has already been decided that admission is necessary. Dr Colm Henry, Clinical Director, Mercy University Hospital, September 2011. Children with respiratory or circulatory distress go directly into resuscitation. Call crash team on 5300 if child brought in collapsed. Call the paediatric team on-call immediately to all critically ill children. If an additional paediatric nurse is required ring St Anne’s at 5217 for extra support. Use the NICE guidelines in feverish illness traffic light system. CAPE triage system is used in the Mercy ED. Encourages families to use the separate, child-friendly, secure paediatric waiting area. All those with GP referral letters are seen by the paediatric NCHD. 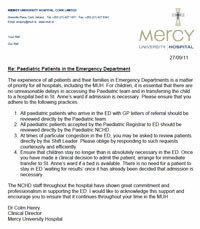 Those without GP referral letter should be seen first by the ED NCHD and referred onto paediatrics if necessary. Early registrar review will expedite admission in uncertain cases. Behaviourally challenged children may require quick registrar assessment to avoid prolonged assessment in ED. If a child requires assessment over many hours they should be admitted. When a paediatric NCHD decides to admit, ED nurses should ring nurses on St Anne’s ward at 5217 so that the child can be transferred promptly. Ring Senior nursing management if this is delayed. Treatment can be started by the nurses while awaiting the arrival of the paediatric NCHD. The nurses can ask the ED NCHD’s to prescribe paediatric medication as appropriate. Nurses calculate and record vitals and weight on the paediatric patients. In a child with acute/ recurrent wheeze nurses can give a nebule of Salbutamol (Ventolin) 1.25mg in those over 4 months and 2.5mg in over 1 yr old and 5mg if over 5yrs. 3 nebulisers are given in ED and response (2 hours) determines if the child needs admission or not. If the child’s temperature is high nurses should give the appropriate dose of Paracetamol 15mg/kg (max 500mg under 12, max 1g over 12yrs) and attach a urine bag to the children in nappies. If a paediatric NCHD requests an X-Ray it should be registered under the paediatric consultant on-take so that all paediatric X Ray reports ordered by the paediatric team are followed up on by the paediatric consultants even if the child is not admitted. The requesting department for paediatric patients in the emergency department is coded as EDPA on the Mediweb system. When a paediatric NCHD inserts an intravenous cannula it should be secured with the help of the nurses/ care assistants in ED so that it won’t need to be reinserted as this is a child’s greatest fear. If a child with fever is well enough to go home (after urine has been dipsticked and appropriately treated) the Nurses should give the family an advice fever sheet. A GP discharge letter should be sent back to the child’s referring doctor and copied for filing with the ED notes. Content by Dr Íomhar O' Sullivan. Reviewed 14/01/2007. Last review Dr 13/09/18->->.